NEW ORLEANS – Historic marks were turned in by athletes across the nation this past weekend. Freshmen also left their mark on the collegiate landscape as well. 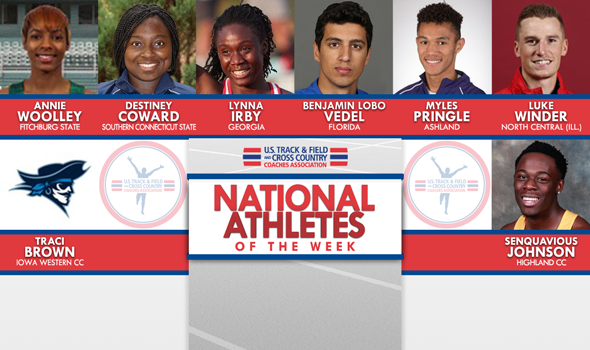 Here are those eight athletes who stood out from the rest and were named National Athletes of the Week by the U.S. Track & Field and Cross Country Coaches Association (USTFCCCA) on Tuesday. Florida freshmen love the Orange & Purple Invitational hosted by Clemson. For the second year in a row, a Florida freshman notched an all-time mark at the meet. Last year it was Grant Holloway. This year it was Benjamin Lobo Vedel. Vedel clocked a time of 32.80 over 300 meters in his collegiate debut to match the fourth fastest time at the distance in collegiate history. Holloway ran that same time last year. Prior to his arrival at Florida, Vedel had success on the European circuit. He was a 2017 European U23 Championships bronze medalist and finished fourth at the 2017 European Indoor Championships. Georgia’s Lynna Irby ripped around the track in her collegiate debut this past weekend at the Orange & Purple Invitational hosted by Clemson. Irby crossed the finish line first in the 300-meter race, clocking a time of 36.73 in the process. She beat collegiate outdoor 200-meter record holder Kyra Jefferson, Florida’s Sharrika Barnett and her own teammate Micaiah Ransby. That mark of 36.73 also stands as the sixth fastest in collegiate history behind the 36.72 turned in by Miami (Fla.)’s Shakima Wimbley last year. No, Myles Pringle didn’t set a season-best in the 400 meters this week. But, what he did do was run the third-fastest time in the event in the entire nation over the last seven days. The junior from Cincinnati picked up his second National Athlete of the Week honor of the season with a blistering performance of 47.10 in the 400 meters at the Akron Pole Vault Convention to pick up his second event title in that event on the season. Pringle was also on the 4×400 relay winning squad in Akron that posted a time of 3:18.67, good for 10th in the entire country this past weekend. Destiney Coward opened up her senior campaign with a bang at the 2018 Dartmouth Relays, as the native of East Haven, Connecticut, posted a mark of 21.29m (69-10 ¼) in the weight throw to take home the event title. Not only was Coward’s mark good for an event title, but it was the top mark in the NCAA Division II on the young season, and is already an NCAA Division II Automatic Qualifying Mark. Coward also entered her name into the NCAA Division II indoor record book, as she is now the seventh-best athlete in the event. Luke Winder opened his senior year on a big stage this past weekend. He was one of just two collegians competing in the elite section of the Pole Vault Convention hosted by the University of Akron. The other collegian was Akron’s Matthew Ludwig, who won the NCAA outdoor title in the event last year. Winder was one of five men to clear 5.35m (17-6½). He took one shot at 5.50m (18-0½) before bowing out of the competition. He ended up placing fifth overall behind Ludwig, 2015 IAAF World Champion Shawn Barber, Chase Brannon and Chris Pillow. Annie Woolley competed in her third meet of the season this past weekend. Woolley joined a horde of athletes at the Dartmouth Relays and took part in the 60 hurdles alongside several NCAA Division I and NCAA Division III athletes. When the dust settled, Woolley finished third but posted the second fastest time in NCAA Division III this season (8.92). Woolley will hope to make her second trip in a row to the NCAA Division III Indoor Track & Field Championships. She was 12th in the 60 hurdles last year. SenQuavious Johnson was a beast on the track for Highland CC this past weekend. The sophomore sprinter posted the top times in NJCAA on the year in the 60 meters and 200 meters at the Ward Haylet Invitational with respective times of 6.90 and 22.51 (track converted) that placed him second behind an NAIA runner in both races. After placing 23rd in the 60 meters at the event at the same meet a year ago, Johnson looks to be much improved. There’s nothing like bursting onto scene in your first collegiate track & field meet. Traci Brown of Iowa Western CC did just that. The freshman product ran the fastest times in the NJCAA on the year in the 60 meters and 200 meters at the Ward Haylet Invitational, winning both events with times of 7.64 and 26.20, respectively. In the 60 meter race, Brown bested her nearest competitor by over two tenths of a second to set a NJCAA Automatic Qualifying Mark.